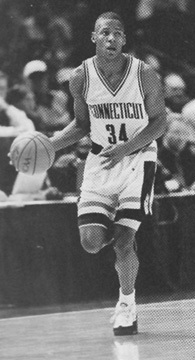 Ray Allen was a Guard for the UConn Huskies from 1993 – 1996. He’s honorary captain of the UConn Basketball All-Century Team and in 2007 he became a member of the first class of Huskies of Honor Program. Ray was the 5th pick in the 1996 National Basketball Association (NBA) Draft by the Minnesota Timberwolves and immediately traded to the Milwaukee Bucks. 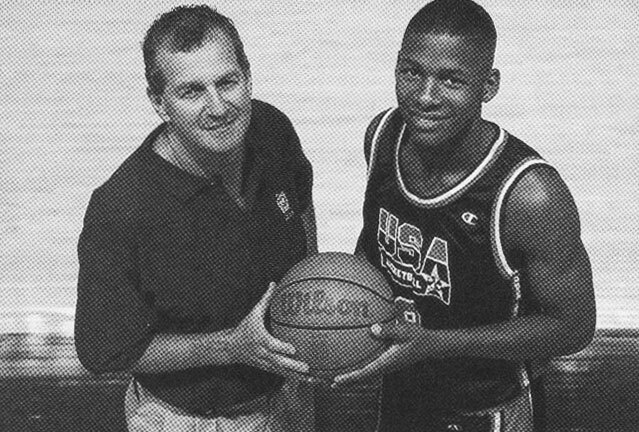 Ray has won a Big East Tournament Championship in 1996, an Olympic Gold Medal in 2000 and an NBA Championship in 2008. This past week he became the NBA leader breaking the record for three-point baskets made. This is a very short list of Ray’s many basketball honors, accomplishments and experiences. I had the absolute pleasure of meeting Ray in August 2010, and talking to him as he reflected on some of his basketball memories. Ray was soon on the UConn campus. Regarding the transition from high school to college Ray said, “That was the biggest of all of his basketball transitions.” Ray was joining a team that was pretty good and as a freshman he provided instant offense off the bench helping the team to reach the ranking of number two in the country half way through the season. In his sophomore year Ray was in the starting lineup. UConn was undefeated longer than any team in the nation and by February they were ranked number one. Ray could have left for the NBA but with the help of his parents decided to stay in college. 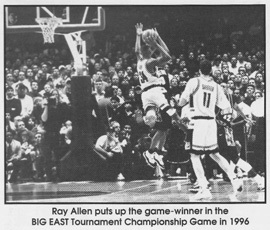 During his junior year the team had 23 straight wins and people were considering Ray an “NBA no brainer.” In the Big East Tournament Championship game Ray threw up an off balance shot that found its way into the basket to win the game. Ray was selected number five in the 1996 NBA Draft by the Minnesota Timberwolves and was traded to the Milwaukee Bucks where he played through the 2003 season. Ray was running the team in his rookie year. By his third year he was a star ranking fourth in the NBA in points scored per game, and made the All Star Team for the first time. Ray went on to set a Milwaukee Bucks franchise record for most consecutive games played with 400. In 2003 he was traded to the Seattle Supersonics. During his time with Seattle Ray enjoyed a regular season career high 26.5 points per game became the 97th player in NBA history to score 15,000 points, broke the NBA record for three point field goals made in a season and scored a career high 54 point game. In 2007 he was traded to the Boston Celtics where he had originally wanted to be drafted to when he entered the NBA in 1997. While with the Celtics Ray has experienced the biggest accomplishment of every basketball player, winning an NBA Championship. He has also reached the 20,000 point milestone, broke the Celtics record in consecutive free throws made with 72. In July 2010 he signed a deal staying with the Celtics for two more years, and just this week Ray became the all time 3-pt field goal leader in NBA history with his 2,561st on Thursday night. The accomplishments and honors for Ray could go on and on and on. In this article I have tried to list just a few of the highlights in his timeline from introduction to basketball to his current playing status. Ray and his wife Shannon have four children, daughter Tierra and sons Walter Ray, Walker and Wynn.